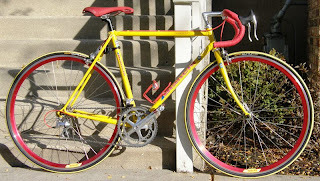 Recently built up by a friend of ours, here is a very pretty Vintage Bianchi available for a fair price. Steel Frame, Handbuilt wheels, Dura-Ace Drivetrain, Fizik Handle Bar Tape, Selle Italia saddle, all for just $800. Grab it before someone else does.